This morning we got a nicely-printed 12-page flyer for Bat 17 in downtown Evanston. It is described as "A distinctive breakfast/ lunch/dinner/deli/pub." The intro says Bat 17 is inspired by some of New York's finest delis. It notes that breads are specially baked for them by Bennison's Bakery and that the corned beef and pastrami are from Kelly Eisenberg. They also thank the people at Zingerman's for their assistance. Sandwiches are RS (regular size) or FS (Full Size -- maybe they meant big fresser size). Most RS sandwiches are $10 +/- a few dollars. The FS are $1.50 more. Somewhat pricey but if they're as good as claimed, understandable. They also have a selections of salads and Espresso drinks. If you just want a cup of coffe, it's free! (Smart promo!) Some of the desserts are from Zingerman's. It sounds worth checking out. A good deli would be a worthwhile addition to the area. Let's hope for the best. I heard about BAT 17 on Monday afternoon. After looking at their menu, I decided that I must try them out. Couldn't get there on Monday, and I fell asleep that night thinking of corned beef. So, I stopped in on Tuesday morning on my way to work and ordered the full-size Buster sandwich (corned beef and swiss on grilled, hand-sliced rye bread) for $11.99. I'm a person who frequently partakes in unconventional breakfasts, so this sounded yummy to me. I was not disappointed! The sandwich was a good size - I ate half for breakfast and the other half for lunch. The meat was lean (but not too lean), the cheese was terrific (from Vermont, I think), and the bread was very fresh and tasty. I was the envy of all those who have cubes near mine. I will say that this place is no Manny's, but I can't make it from Evanston to Manny's and back on my lunch break! I will happily settle for this very tasty sandwich here in Evanston, even though it is more expensive than Manny's. When I need corned beef, I need corned beef! My colleague gave a big thumbs up for the pastrami and said that it was appropriately spicy and smokey. The sandwiches come with a full-sized bag of chips and a pickle spear. On the days that I'm working in Evanston and need a deli fix, BAT 17 will be my go-to place. On Saturday when I'm in the city, you'll find me at Manny's. I'm intrigued by this but as much as I'd like to ry it, till I start making a lot more money, Im going to have to stay true to the Bari 12" Italian for half the price. I ran the address in Google Maps and it looks like they are in the Le Peep space. Are they? No - they're just north of there on Benson - there've been several Thai places in there over the years. They are in a space north of Le Peep. It used to be a small, thai restaurant. Folks in the office were talking about BAT 17 after lunch today. Several folks went and most ordered soup and then split sandwiches. They reported that the soup was quite good, and their combo-creation was quite satisfying. Went & checked this place out this evening. They have been open one week today, and in some aspects are still not firing on all cylinders (as should be reasonably expected). Don't go here expecting a Deli w/ a capital "D" - I'd say the place is more of a hybrid of a bar with high end food and a deli. The Good: Top notch ingredients throughout. This is promising, as without a solid foundation, it is impossible to achieve excellence. The meats (corned beef & pastrami at least) are by Eisenberg, w/ free range chicken & turkey selections, and also a small number of pork offerings. The breads are specially made by Bennison's bakery. I really liked the "Wedgy" salad (their take on the classic steakhouse salad) though next time I think I'd skip the tomato. The No-So-Good (I hesitate to be too harsh since they just opened) - I had the Carnegie Rueben, and it came out a bit soggy - this could have been due to a heavy hand with the kraut & their trying to time the sandwich after a soup and salad & not getting it quite right (not that big a deal in my book). More worrisome was the lackluster chili, but it was saved by a really nice slab of fresh, crusty bread. With a better soup this combo could be outstanding. So, for my first visit, I'd say they have potential, but the jury is still out. I'm not ready to rave about the place just yet - I'm sure they will get things dialed in a bit over the next few weeks & I'll give them another shot later. It's certainly a big step up from the not-so-hot Thai places that have occupied that space in the past several years. I was told about Bat 17 and immediately checked out their menu online (http://www.bat17evanston.com/BAT%2017%201-4-07%20menu5.pdf). While I cannot figure out why (and hate) when online menus are PDF's and not simple HTML is beyond me, but I digress. Anyhow, while a much smaller version, the menu reminded me a bit of what D.B. Kaplan's used to be, which was an old favorite of mine. Choices are certainly limited compared to what D.B. Kaplan's, but because of that thought, I feel like we could have a winner here. George R wrote: They also thank the people at Zingerman's for their assistance. I think Zingerman's advised them on the prices. Seriously, the place is pretty good, but definitely needs fine-tuning. What I liked: Excellent bread, good gorgonzola coleslaw, free coffee, friendly staff, extremely flirty waitress. Needs work: I'm not familiar with Eisenberg products, but the corned beef was very dry. I actually like lean corned beef and this was much too dry even for me. Quality seems to be high across the board. If you get stuff to go, it comes with thick napkins and silver-colored plastic fork and knife in a sturdy bag with handles that makes it look like you're a man about town just back from a Burberry shopping spree at Barneys instead of an unloved loser slinking back home to eat your sandwich and cry. I'll definitely try it again, maybe the chicken or turkey this time. I hope they succeed, but at this price point, it does seem like a challenge. I just finished up a cup of chicken noodle soup from there. It was OK. It was edible. Tasted pretty much like Campbell's, so definitely not worth $5. The free coffee was the best free coffee I have ever had, which I realize is damning with faint praise. I plan to give it a second chance, though - the sandwiches look pretty enticing. And it's two blocks from work. Just had my first lunch at Bat 17. My mom and split the basic corned beef sandwich (i.e. the one without cheese and russian dressing). Sandwich was good, not amazing, but definitely as good as expected. The "regular" sized sandwiches are big. I'd say I have a normal to above-average appetite and I was definitely filled up by the half sandwich. At $10 a sandwich, this is fine if you have someone to share with (or want to take the other half to go). The gorgonzola cole slaw was nice. The waitstaff was friendly. I'd recommend that they tone down the whole "inspired by NY deli" stuff (especially since that was a connection I never would have made). The place fills a nice gap in downtown Evanston and I'll definitely visit again. NY deli? I wouldn't even compare it to a Chicago deli. I had one of the worst corned beef sandwiches of my life here. It tasted as though they had first boiled, then microwaved, and then fumigated the flavor out of it. Perhaps they have some sort of centrifuge back there in the kitchen? If there was any corned beef DNA left in there... even its birth-mother wouldn't have known it. The bread was soggy and stale at the same time. But if I wanted Grey Poupon on it... arrgh. But the portions were ample. So I would highly sugggest the free coffee. We went to Ravinia a few weeks ago and friends of ours brought an excellent spicy potato salad. I'm pretty sure it was from this place. bryan wrote: So I would highly sugggest the free coffee. Actually, I was going to mention the free coffee after my first (and so far only) trip to Bat 17, just 'cause I think it's a cool thing for them to do. But the coffee is really not good at all, at least on that occasion, which was on a late Sunday morning when you might think coffee would be fresher and in higher demand. Tried Bat 17 post-matinee yesterday and was underwhelmed. Admittedly, I have an instant bias against sandwich joints that can't offer something for less than $10; they better be offering something special at those prices. After filling up on overpriced popcorn at the movie, we let minimalism be our guide and opted for appetizers: sliders and onion strings. Unfortunately, minimalism has been run out of Bat 17 on a rail: the portions were more than sufficient for two to split - and for two soft drinks and two appetizers our bill was over $20. Neither, however, was noteworthy: the burgers not bad if a bit overcooked, the onion strings were underdone and greasy. Both came on platter-sized fiestaware; the onion strings were piled two fists deep, and the sliders came on a huge pile of lettuce, deli pickles, and tomatoes. As we left, I mentioned that the place reminded me of Hamburger Mary's without the schtick. While I wouldn't make a fuss to avoid this place, I doubt we'll be back. I think the space is part of the problem: there's a completely superfluous counter with chips and a dessert case containing a couple lonely-looking pies across the back; the free coffee takes up one whole side of the space, while the bar takes up the other, using up valuable real estate and making for a claustrophobic atmosphere. If they removed everything but the bar, they could easily get 4-5 more 4-tops in there, and probably get enough business to reduce their prices from to . From what I read here, they might do even better by making the "small" portion more like a single portion. I'm all for inexpensive, overportioned, comforting divey-bar food - but that's not what Bat 17 is about. Just wanted to say I really think this place is solid, it isn't the best but has a lot of character that appeals to me. My wife loves the vegetarian items and I'm always up for the Buffalo Sliders. ...and the green chile cheeseburger. I went with the Evanston Lunch Group to Bat 17 and sadly was underwhelmed. They don't accept reservations, and when I arrived early I was told that they have a firm rule about not seating a party until everyone is present. As is typical of LTH gatherings, not everyone expected attended, so if the policy were adhered to strictly we would never have been seated, but finally the waitress, after checking, permitted us to sit. 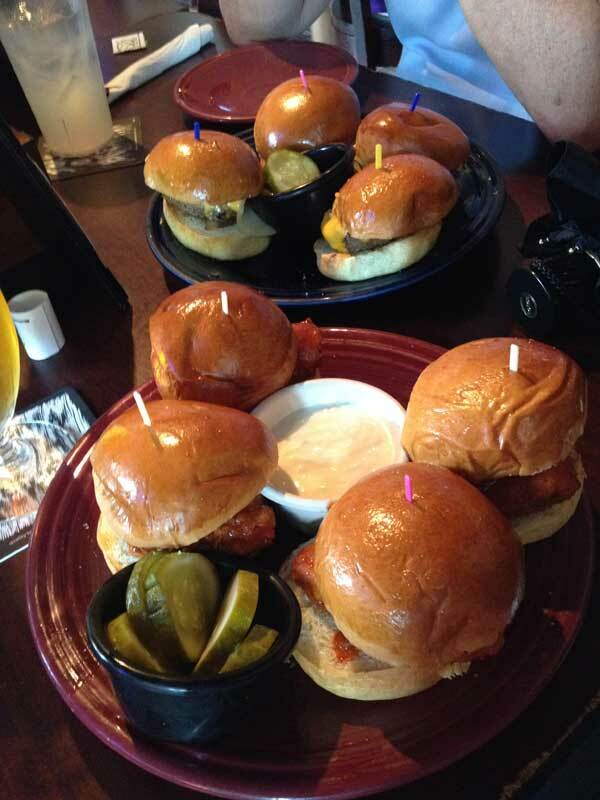 Given the small size of the party we ordered two sets of sliders and a Reuben sandwich. Perhaps it was the small size of the sliders, but my cheeseburger was dry, as was the buffalo wing slider. The Reuben was better, but far from the best of the genre: adequate corned beef (not very peppery), unmelted Swiss cheese, and a thin smear of Russian dressing. In contrast, the shoestring onions were quite addictive. Add this this, a noise level resulting from construction (which should be temporary) and music (not so), and the lunch disappointed. I mostly agree with Gary. My impression was that, in general, the quality of the food ingredients was high, but once assembled, the whole was far less than the sum of its parts. The brioche buns on the sliders (Buffalo Chicken in front, Traditional in back) were good, the Buffalo Chicken had a nice spice level, with ranch dressing served on the side (I would've preferred Blue cheese). But without the dressing, it was just a somewhat dry piece of spiced chicken on a bun. The traditional sliders were equally dry. There were quite a few sauces on the table; perhaps the sliders were intentionally dry anticipating that we'd use our own choice of sauce to add moisture to them. However, if that was the idea, it would have been helpful if the server had suggested it. 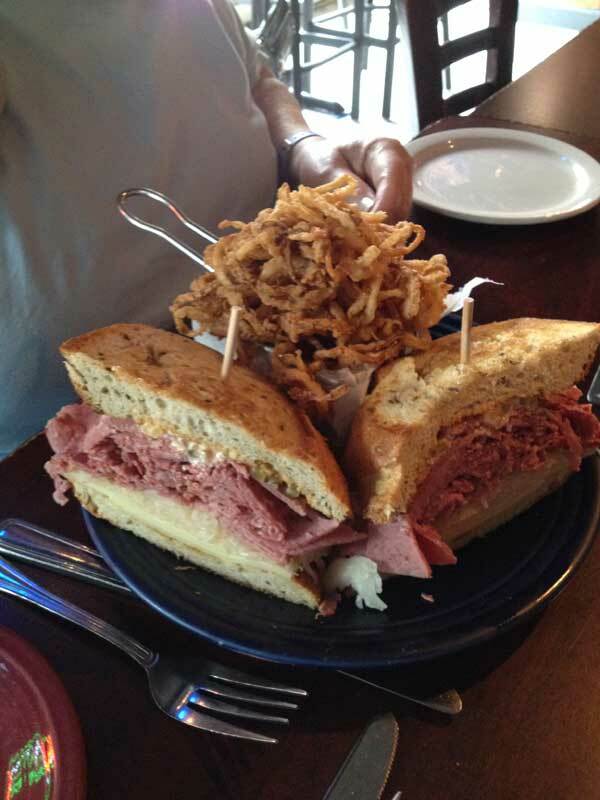 The Reuben was similarly dry; in this case, another dollop or two of Russian dressing would have helped. But as you can see, the portion of corned beef was generous, to say the least. In fact, overall the portions seemed geared toward a Northwestern male freshman. For a relatively small place (there's a second, larger room that opens in the evenings), it had a pretty good beer list. And for true beer gluttons, they offer 105 oz. towers of beer of anything on draft. Personally, I thought 105 oz. of beer might be a bit much for lunch. Bat17 isn't a destination by any means. The few times I've been there previously, other menu items fared slightly better. I think it's a good idea to go there with the idea that it's a locally owned, locally sourced place serving its version of TGI Friday's food. After visiting at Evanston Hospital, Mrs Willie & I went for dinner this evening. Very good craft beer selection. Chicken salad was mostly shredded, flavorful chicken salad, a bit heavy on the mayo. My meatloaf sandwich with smoked gouda & sauteed onions was quite delicious, bread stood up the ingredients, only complaint is that I would have liked the bread toasted more. nr706 wrote: In fact, overall the portions seemed geared toward a Northwestern male freshman. Agreed, Mrs Willie & I both took home 1/2 or respective sandwiches. 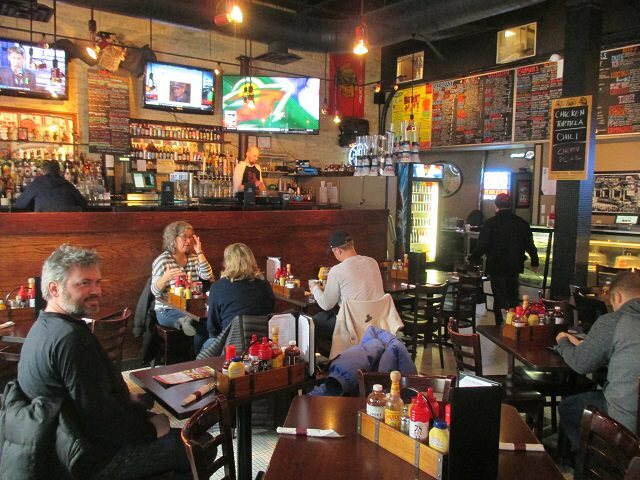 We've been spending more time in Evanston lately, and noticed Bat 17 walking from parking on Benson, with signs saying it's been voted best restaurant and burger in Evanston for years running. So when we met with friends to see a movie the other day, we suggested it. They were surprisingly able to accommodate a group of 14 on an early Saturday evening, and treated us very well. They seem less of a deli than the posts above: the dessert counter is still there with big cookies and a slab of Red Velvet cake, but the emphasis is more on hot sandwiches than classic deli, although corned beef and pastrami do make up a good-sized portion of the menu. The menu is divided into Burgers, Sliders, Beef, Chicken, Turkey, Vegetarian and Pork. Prices have crept up, with the average around $14 including a side. The burgers are big, 10oz, cooked perfectly medium rare, with good fries and onion strings on the side. My "black and blue" had a a cajun spice crust, a nice slab of onion strings (versus the couple of meager strings some places put on), blue cheese crumbles, plus a cup of blue cheese dressing to add on/dip the fries and strings into. The bar and grill aspect has definitely been kicked up with a large beer list (Virtue cider on draft and a bunch of the Vandermills in cans). The space immediately south is their "Dog House" open only in the evening and serving only hot dogs with various toppings. They are also opening a barbecue restaurant in the former Dixie Kitchen / Ya Hala around the corner on Church called Falcon Eddy's. We definitely enjoyed it... but it doesn't top Edzo's in my book, and Buffalo Joe's burger with Merkts cheese is up there too. I eat lunch regularly at Bat 17, and coincidentally with reading this post, I'll be there again an hour from now. I vacillate between the salads (healthy!) and the burgers (tempting!). 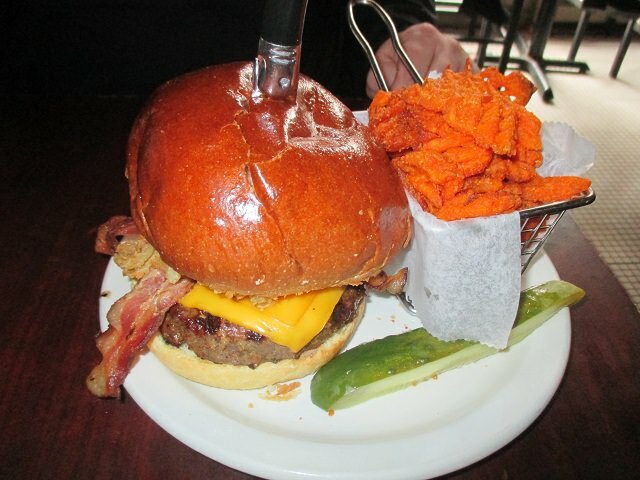 They do an absolutely terrific cobb salad, and their burgers are also outstanding. I haven't quite finalized which I'm getting today, but it will almost certainly be one or the other. They also have nice touches like unlimited refills on the soft drinks (which are large - 24 oz I'm guessing - so you might not need refills), two sizes available on the salads, side dishes included with burgers, etc. I too do not really consider it a deli, because of its emphasis on things other than cold sandwiches. But that's just a matter of semantics. It's one of those "under the radar" places you don't hear much about, but they consistently turn out excellent food, at reasonable prices. I've been extremely happy with all my lunches there, and look forward to returning again and again. JoelF wrote: We definitely enjoyed it... but it doesn't top Edzo's in my book, and Buffalo Joe's burger with Merkts cheese is up there too. For burgers, I'd be hard pressed to choose between Bat 17 and Edzo's, because they're both absolutely top notch. I'd easily choose either over Buffalo Joe's. Last edited by nsxtasy on April 16th, 2018, 1:54 pm, edited 2 times in total. K-2 Bat 17 Burger - a spectacular ten ounce burger, applewood smoked bacon, American cheese, onion strings, served on grilled brioche bun. 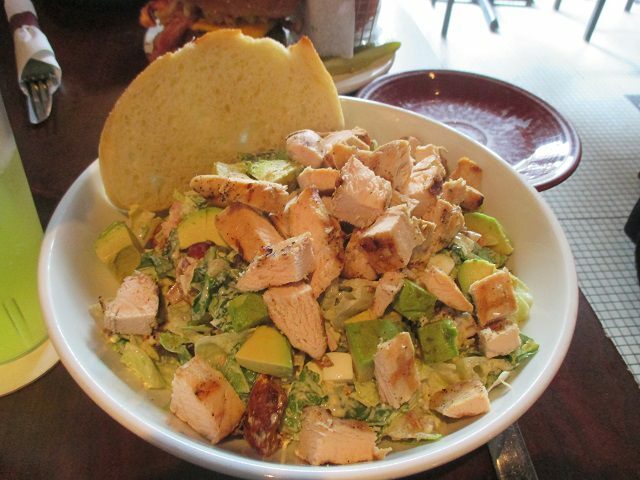 Cobb Salad - free range grilled chicken breast served atop a blend of greens, bleu cheese chunks, Roma tomatoes, egg, applewood-smoked bacon, avocado slices, homemade croutons and tossed in our own bleu cheese dressing.